Centum offers to its customers value through innovative supply chain solutions, global sourcing support and local procurement, careful inventory management, advanced Component life cycle management and lowest landed cost solutions. Centum creates value by increasing speed to market for all NPI (New Product Introduction) through a Customized solution thus enhancing cost saving through faster production ramp-up from its Low Cost manufacturing locations. Centum supply chain solutions are built to cater to high-mix, high-technology medium to low volume requirements. Optimized commodity based supply chain solutions via strategic global supply base. Global Price Management, Procurement, and Risk Mitigation. Continuous Focus on Cost Management through commodity approaches and supply chain solutions and strategies based on customer dynamics and industry served. Use of IT tools/infrastructure from RFQ management with Global suppliers. In-house tool engineering & design solutions. In-house injection moulding & small metal stamping capabilities. Centum comprehends that same planning process does not fit the dynamics of different Customers. Centum has strong Customer Focus Teams (CFT) that work in tandem with Planning & Purchase Team in terms of setting up Customer demand management, map existing supply chain processes and use planning and analytical tools to design a supply chain capable of meeting customer-specific requirements for reliability, responsiveness, flexible and cost. Strategy & Planning: Build-to-Forecast or Build/Configure-to-Order. Demand & Supply Management: Order Fulfillment. 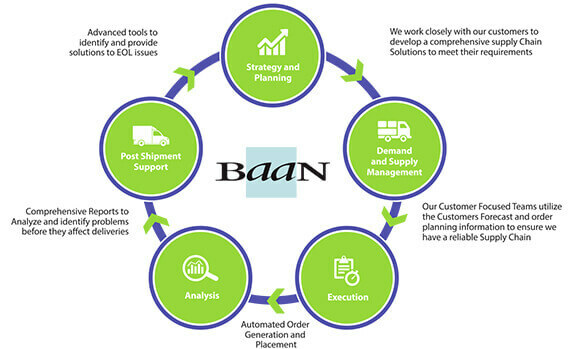 Post Shipment Support: RMA & Component Life Cycle Management .